2. Open App & Accept Terms & Conditions. 5. Now You Have Registered Sucessfully. 6. Verify Your Email Id to Start Earning. 8. You will See Banner Like Below , Simply Click On Participate Now. 1. In This Referal Offer You Can Earn Huge by Level Income. 2. 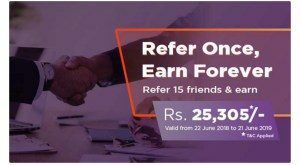 Rs.7 For Every Friend You Made , Your Referral Made Further & Even If His Referral Made Refer.